Aliens of Manchester might find it easy to confuse the exact whereabouts of The Lowry Hotel. Until a few moments before leaving for The River restaurant I was convinced we were heading to Salford Quays, which is home to the Lowry museum. Although I can appreciate the artwork of L.S Lowry I’ve always found his paintings somewhat dreary, everything, in fact, that Manchester’s first five-star hotel is not. 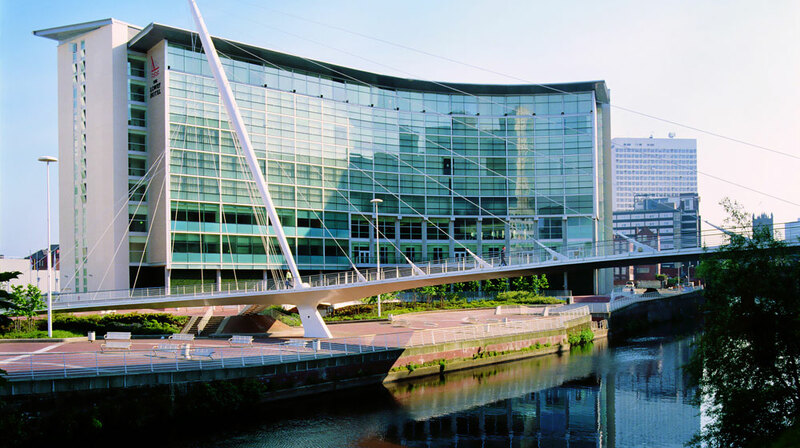 The Lowry sits on the banks of the River Irwell, the proud glass front allows visitors to look out onto Manchester and Salford, in the evening the pretty city lights blink like an old dog desperately trying not to rest its tired eyes. Even on a dark, late September evening, the mint green of the dining room walls and vertically striped curtains are light and airy. They’ve not jumped on any fad, there aren’t any waxed skulls lighting up tin plates or rose gold, it’s just modern, stylish and comfortable. There is plenty of space between the tables and we are left undisturbed by the other diners discussing ‘business’ or moaning about the kids. It was quiet for a Saturday night and even with the Manchester United football team staying over before tomorrow’s match, we seemed to get just the right amount of attention from the waiting staff and the evening was peaceful. The menu is an exciting list of vanilla foam, caviar, almond bon bon’s, lemon emulsion and spinach air, everything about it says special, it’s the kind of place you’d want to bring your mother in law, or even your father in law but, maybe not both at the same time since it’s quite pricey. Choosing a starter was more difficult than deciding to put down my pet rabbit, but I decided to go for the Foie Gras (£14) hoping that unlike the rabbit, it wouldn’t go down with a bang. Elderberry, rhubarb and apricot compote complemented the most beautiful foie gras I’d ever tasted, on the plate it was a work of art and next to the Salmon Roulade (£11.50) with coriander, caviar and crab mayonnaise the table was turned into a gallery of masterpieces. Everything on the table, throughout the course of the evening was worth eating, flavours emanating from every dish in their individual and extraordinary ways from the mains of Cheshire Sirloin Steak (£26.95) to the triple cooked chips (£3.95), crunchy sugar snaps, mangetout and French beans (£3.95), to the intensely autumnal orange poached carrots with sweet kumquats (£3.95). Unlike the hipster hangouts I seem to be drawn to usually, with queues so long it ‘must be good,’ it seems the better a place is, the less people there are, it’s only the kitsch places, with the ‘groovy’ menus that attract flocks of bearded men and girls in bobble hats, giving the Bird Yard, Dead Penguin, Ugly Fish or whatever ironic name they can come up with its five minutes of fame. With places like the Lowry, its reputation will see that it continues to thrive long after the clubs have closed down and the cool kids have moved on. The Lowry is the place to find the fruits of the earth, the best fish of the sea and the tastiest cattle in the land, all expertly rustled up by the hands of a food god in their kitchen and enjoyed in their beautiful restaurant.